Continuing an aggressive expansion, Games.com on Wednesday is slated to officially launch an automated service for developers to add their games to the AOL-owned platform. “There will still be a review process, but it’s self-service… sort of like Google AdWords for game developers,” John Fox, General Manager of Games.com, said. 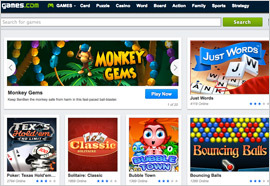 The effort follows a recent relaunch of Games.com, which included new engagement and personalization features, as well as mobile and tablet compatibility. According to Fox, the site has seen a 25% boost in worldwide usership since the relaunch last October, along with an increase in engagement levels of 15-20%. Fox, however, has even higher hopes for the new “Developer Center,” which is expected to be unveiled on Wednesday at the Game Developers Conference in San Francisco. In private testing, Games.com added around 150 smaller developer partners to its existing stable of roughly 40 larger partners, according to Fox. The result will be “a significant increase in traffic,” Fox promised. In February, Games.com attracted 5.3 million unique visitors worldwide, according to ComScore MediaMetrix. The new developer partnerships spell unique opportunities for advertisers, Fox said. Like little digital agencies, Fox said he plans to encourage game developers to build “advergames” for brands, and compete against each other for such partnerships. “Developers are very interested in the idea,” Fox said. While advertising remains the platform’s key method of monetization, Games.com just rolled out the ability for developers to conduct “micro-transactions” with gamers. Going forward, Fox says he has great confidence in small, independent developers to creates the next gaming sensation. “Many of the latest hit games are coming from independent developers,” he said. The Developer Center was created with input from independent developer studios, including Berzerk Studios, BigPoint, Brad Borne and GamePoint. Presently, Games.com boasts a library of more than 5,000 free online games.